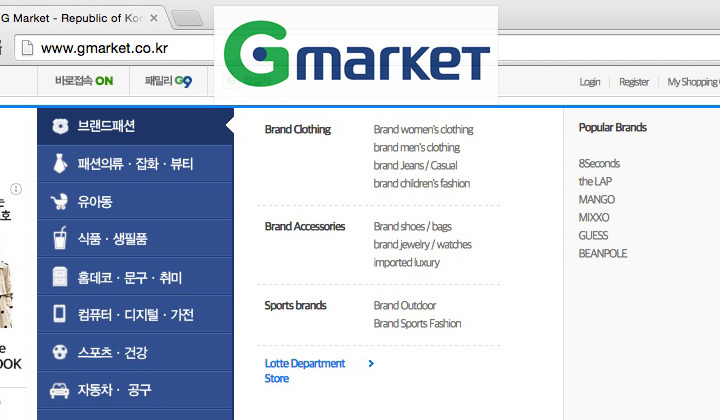 Gmarket is the most popular online auction and shopping mall in South Korea. And the biggest site to shop for Korean goods! There are two websites, but English speakers are shoved off to the ‘Global Market’ which just isn’t the same! I must say that a lot of effort has been done to bring this e-commerce monster to the access of foreigners on a global level. Thanks to how international sending works, where sellers first send the goods to the Market warehouse before the stuff gets sent abroad. Making it much easier for Korean sellers to go international. However, if you reside within South Korea or need special goods that aren’t available anywhere else. I highly recommend the original experience on their main site. We can easily convert most of the site to English. However, Gmarket has an old-fashioned way of using a lot of images as text. These are obviously more difficult to translate. But with some common sense, you can surely pass through the test! The easiest options are if you’re on Google Chrome or Mozilla Firefox. Chrome: This has the translation option ready installed. Just make sure that your native language is set to something else than Korean. It should ask you if you want to translate the website into English. Firefox: Google Translator Extension is my favourite, very easy install and gives you totally automatic page translations with one simple setting. It’s interesting when most people, who are flocking to Gmarket, are unaware the company was actually founded way back in 1999. That’s over fifteen years ago, which in today’s time, amounts to a century. The online auction and shopping mall was founded by Young Bae Ku and originally domiciled in Seoul, South Korea. Led by the business acumen of Young Bae Ku, Gmarket was acquired by eBay for 1.2 billion in June, 2009 and became known as eBay Korea Co., Ltd but is continued to be branded as Gmarket. This venture put eBay on the map in the Asian e-commerce marketplace. Although the backbone of the company is its auction platform where virtually every product is up for sale, Gmarket offers new products for sale as well. Since the company’s policy is not to pre-approve the massive amount of transactions, there was a period when shady characters offered interesting items such as towns and human body parts for sale. The company does publish a TOS (terms of service) but frequently reacts to listings rather than policing new offerings by its members. Revenues are accumulated by fees charged to sellers for each transaction which is similar to the eBay platform. The company also rakes in enormous profits generated by advertising revenue. The company relies on a buyer and seller rating system to ensure that transactions are kept on the up-and-up (sounds a lot like eBay) and makes the accumulated ratings conspicuous on its platform. Affiliates are encouraged to participate by placing Market product images and links on the affiliate’s website. There is money to be made by anyone willing to participate in this business model EBay has made millions for its US audience, and Gmarket is staking its claim in Asia. The company made its IPO in 2006 but has since been removed from the NASDAQ by eBay. As for Young Bae Ku, he appears to have his hands full overseeing his eBay joint venture, Qoo10, working to grow market share in Singapore, Indonesia, Malaysia, Hong Kong, and China. The same trick works for the Gmarket equivalent in Japan. The best online shopping for Japan goods of course! Please, see the guide I wrote earlier about how to use Rakuten Japan in English. Thank you for reading and please, share if helpful. Comments, questions on GMarket in 2018 welcome! In South Korea, absolutely. Thanks.